Now, for the moment you’ve all been waiting for: The Airsoft Gun Guy’s favorite airsoft pistols of 2018. 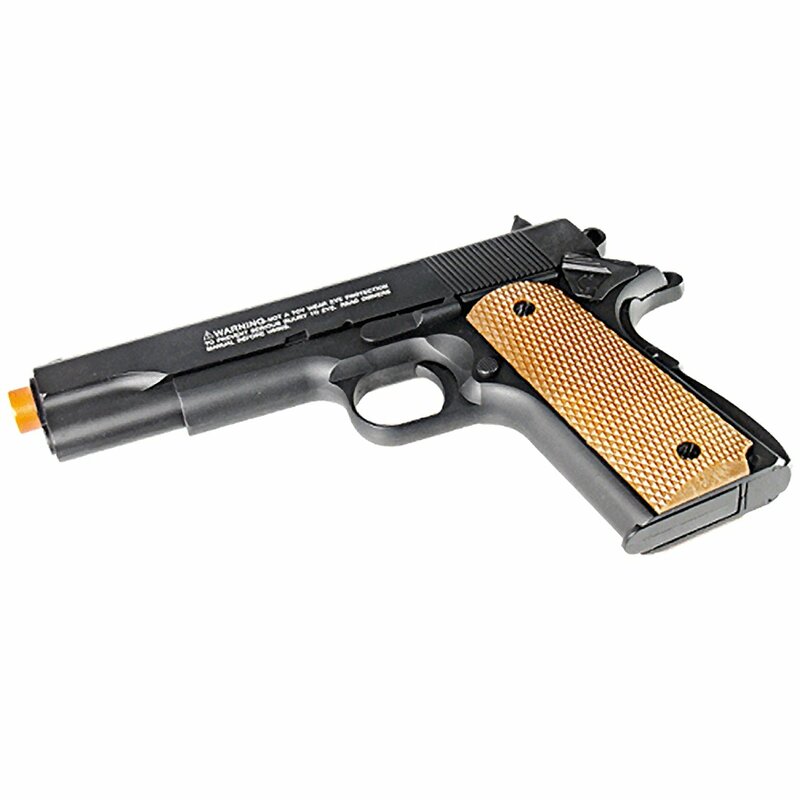 The first choice on the short list for the best spring airsoft guns of 2018 is the UTG Sport M1911 Full Metal Spring Pistol. Unlike a lot of spring airsoft guns, this baby is 99% full metal, and the trigger actuates the hammer of the gun. The only parts of this gun that are plastic are the grip (having a metal grip would be weird), and the short outer barrel. Even the damn magazine is metal. This baby feels real, with two safeties, just like the original M1911. The UTG Sport M1911 has a lower 13-round mag (1 fewer than the actual double-stacked M1911 mag, but 4 more than the Colt’s M1911 magazine capacity), with 90-BB speed loaded compartment when you’re in a pinch. 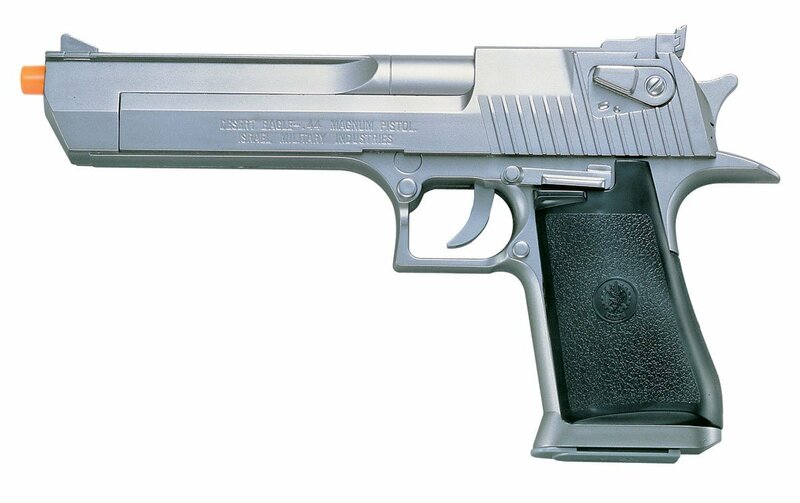 The second choice on the list is the SoftAir Desert Eagle .44 Magnum. Call us a sucker for the Counter Strike days, but who doesn’t love a good ole deagle? Just like the original, it’s a big f*cking gun, weighing in at one pound despite being made of plastic. This gun feels like it would be super heavy with a metal construction, as it is already really heavy for a plastic spring pistol. Also just like the original, this gun is solid, it’s accurate, and has a great range. It also comes in the iconic two-tone silver and black (as well as all black). The best part: It has a 28-round mag (!) and you’ll have no problem reaching for this sidearm when you need to. This one is a two-way tie for first place. First is the KWA Adaptive Training Pistol LE (KWA ATP LE). This gun looks like a glock and feels like a glock. 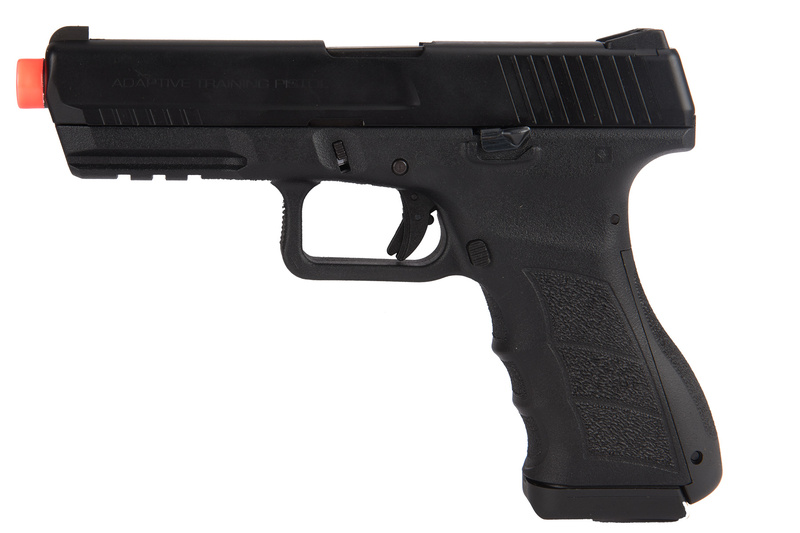 You may be wondering why this 23-round pistol (did we say it has 23 rounds? 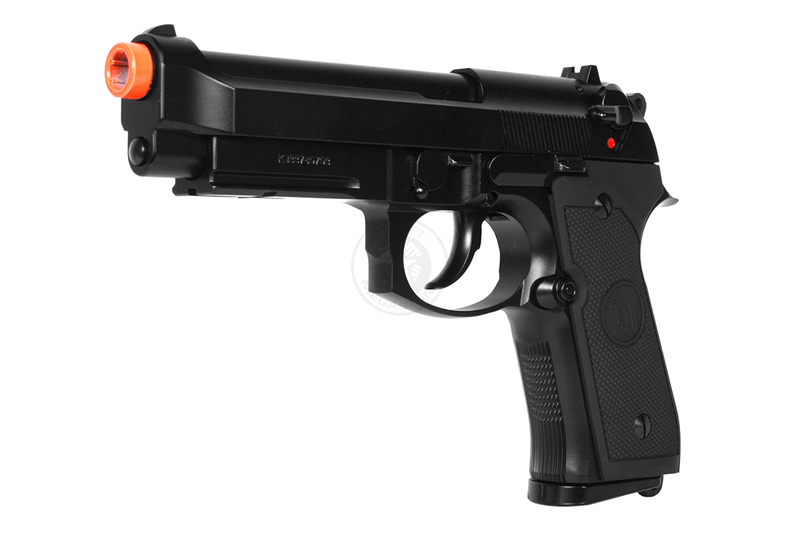 It has 23 rounds) has “Adaptive Training Pistol) in its name. Well, this airsoft pistol is used to train law enforcement. Yeah. It’s kinda realistic. The KWA ATP LE has a railed polymer frame for mounting accessories, a metal slide, and infinite capacity for upgrades. It fires at 350 FPS, has a tri-dot iron sight, and curved ergonomic pistol grip. The next one is the KJW Full Metal M9A1 Gas Blowback Pistol. This is a replica of the Beretta M9, will run on either CO2 or green gas, and is made to last even with the gas blowback stress. Without the orange outer barrel, you would swear this was the real thing. It shoots as 300-340 FPS, satisfying stopping power, a 25-round mag, and great aftermarket support. 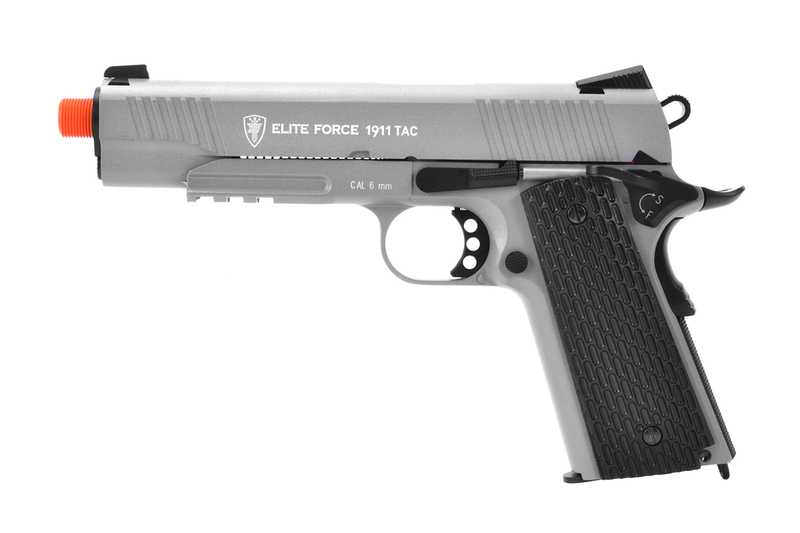 First on the list is the Elite Force 1911 Tactical. Yes, we know, Elite Force is a rebrand, but hear us out here. The Elite Force 1911 tactical is one of the most popular pistols in the airsoft world for a reason. It has a rugged full metal construction (even the barrel is metal), and this thing is nearly unbreakable and built to LAST. We love our realistic replicas, and this thing just looks and feels like a 1911. It breaks down like a 1911, it is as rugged as a 1911, and even has a threaded outer barrel to attach a (mock) suppressor just like the 1911. It has a textured plastic polymer grip, gets a whopping 3-4 magazines per CO2 cartridge, and shoots at 345 FPS. The magazine has a low 14 rounds in the mag, but that’s about the only con to this pistol. It’s an absolute beast. 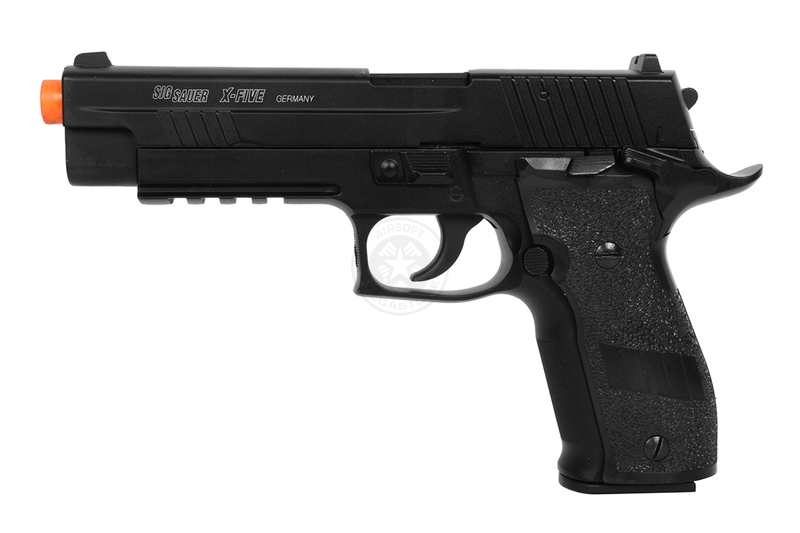 Next on the list is the Cybergun Sig Sauer P226 X5. Speaking of realism (can you tell we like realism yet? ), if you painted the barrel of this gun you would swear it was a Sig Sauer with real bullets in it. It’s short yet heavy, compact yet has a kick to it. It has a serious 28 round mag on it, and will leave your opponent reloading while you have half your magazine left. It also has a railed lower frame for the optional tactical light. Its 300-330 FPS makes it better for indoor play than outdoor. It has a single- and double-action trigger on it.